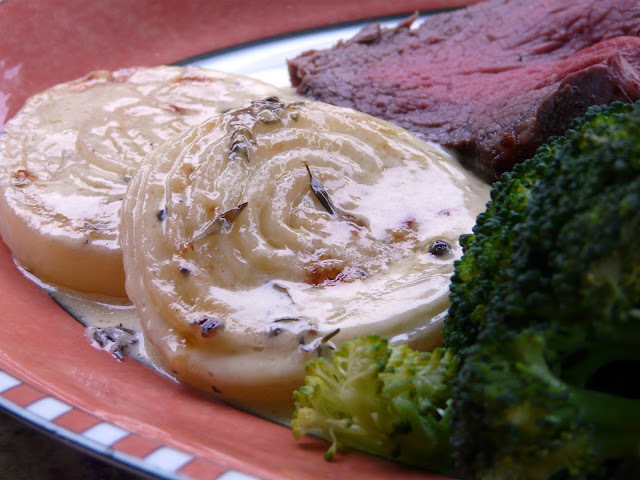 If you love onions, you have to try this dish. Talk about succulent! The yellow onions are pretty pungent when you slice them, but surrender their kick when they are roasted and become sweet and tender. When they reach this point, the cream sauce is poured over them, they are topped with shaved cheese, and then the whole thing is returned to the oven for a slow melt. I like to cook these in a wood oven to get some smoke on them, which makes them even better-if that's possible. Great with chicken, lamb, beef-you name it! I also like it served as a first course. 2 slices the onions into 1/4-inch-thick rings and lay them in a shallow baking pan, such as a sheet pan or jelly roll pan. Drizzle with the olive oil and season to taste with salt and pepper. Roast for 15 to 18 minutes, or until lightly browned. 3 Meanwhile, in a medium saucepan, bring the cream and wine (and garlic) to a simmer over medium-high heat. As soon as the liquid starts to bubble around the edges, remove from the heat. 4 Spoon about a tablespoon of the cream mixture over each onion slice. Cover with aluminum foil, return to the oven, and cook for about 25 minutes. Increase the oven temperature to 450°F. 5 Remove the foil and top the onions with the shaved cheese. Return the pan to the oven and cook for 4 to 5 minutes, or until the edges caramelize. Serve hot. Hi Ann-My husband would LOVE these! 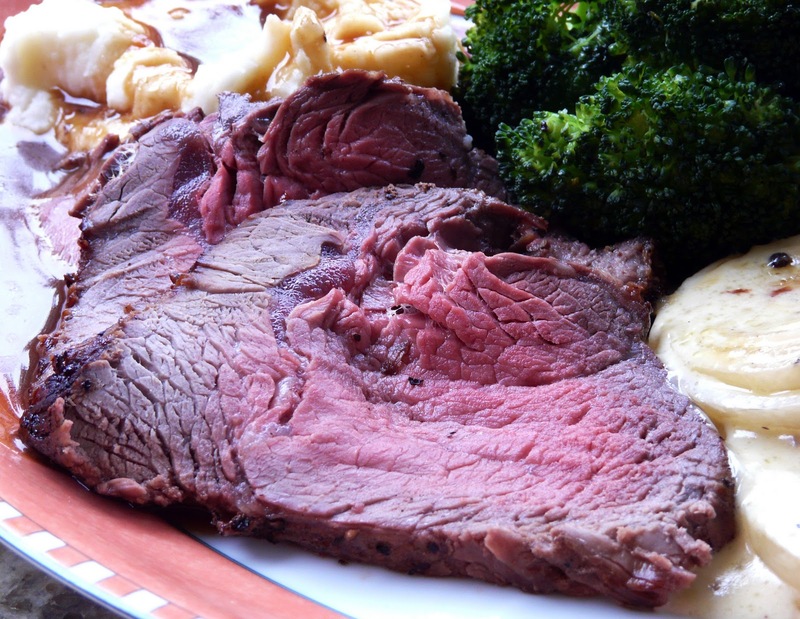 What's your favorite recipe for roast beef???? Oh... I want that meat and potatoes now, AND the onions (you can keep the broccoli). Only kidding! EVERYTHING looks scruptious! You are some great cook and great photographer! We're onion lovers here - will definitely try this with the next bit of beef. Those onions look fabulous Ann! I'll be trying them with steak. And the lemon loaf last post? Delish! Jennifer, I roast at 500°F. 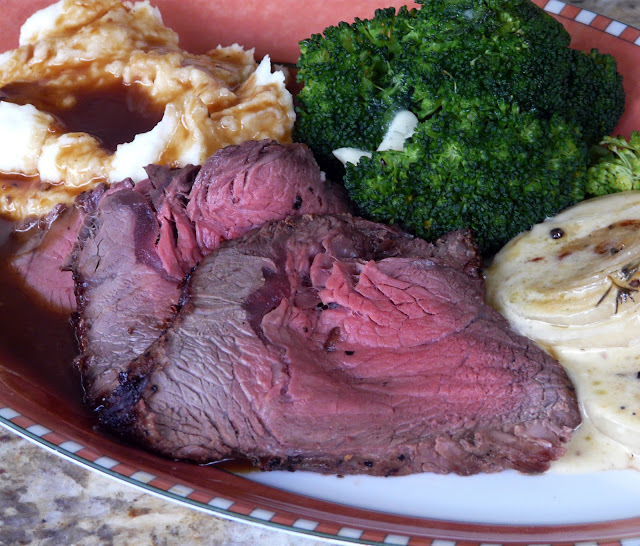 We like our beef on the rare side so I usually take it out of the oven when the temperature is between 114°F and 120°F. I let it rest while everything else finishes cooking. I rub beef roasts with fresh garlic, salt and lots of black pepper. And, if I plan ahead, I presalt the roast one to two days in advance. Pondside, , Barbara, I hope you like them as much as we do. 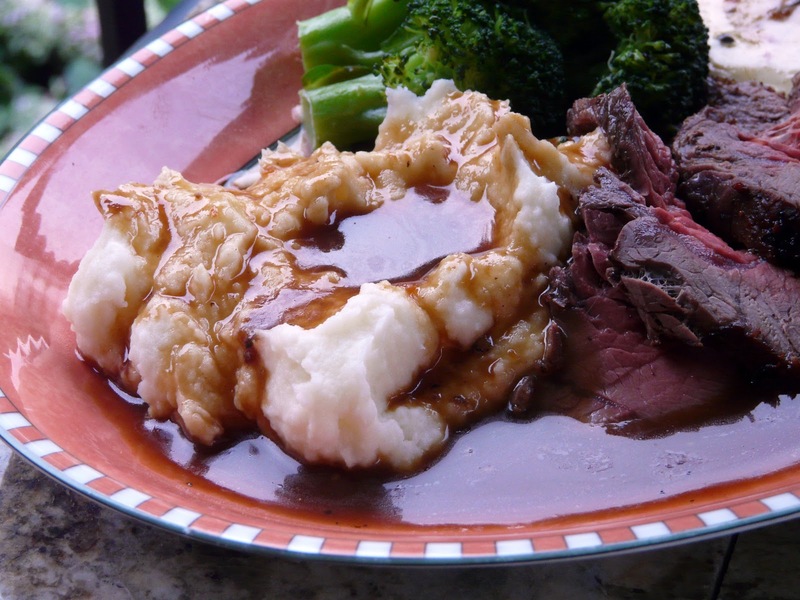 This is an OMG meal - the beef is perfectly cooked, then mashed potatoes and brown gravy, all topped off with the creamed onions and the color of the broccoli. I'd about fly to Canada for this meal. On a rainy day like today this is the comfort food we crave. I haven't even had my morning coffee and I could go for a plate of those onions! I would have to say that you have created a perfect meal...in my book anyway. This is true fall comfort food. Oh my that looks beyond delicious!